Please use this thread to indicate if you're coming and booked. A head count is needed to ensure enough rooms are available. If not, then additional rooms can be obtained. Thanks for arranging the rooms. Am I correct that all 4 days will be riding days so those of us coming from afar should book the nights of Sept. 12, 13, 14, 15 and 16? We should plan on arriving the afternoon of the 12th. and leave the morning of the 17th? People will be arriving on different days based on their schedule. Some will be arriving Wednesday (no group ride as the ride to the hotel IS the ride ), some on Thursday and still others will be coming Friday. With that said, group rides will be done for Thursday, Friday and Saturday. This hotel was picked as they are motorcycle friendly, have lots of parking space for trailers and bikes and rooms rates are reasonable. The location was picked for a central location to Ohio (i.e. Hocking Hills and the tripple nickel) and West Virginia. I will be arriving Wednesday afternoon (I am 10 hours away). So I will book for four nights. If one is arriving on Thursday, book for 3 nights and so on. Don't wait to long to book as rooms tend to go fast. Find a roomie and cut your cost in half! Post here if you want one. Room booked for 4 nights arriving Wednesday, Sept. 12 and leaving Sunday, Sept. 16. Looking forward to seeing old friends and meeting new ones. Will plan to arrive on Wednesday afternoon. Looking forward to seeing the whole group from last year plus a few new faces. Hopefully I will be meeting up with others for the ride down. Last year we had Corkster 52, Wingcott, Detdrbuzzard, and myself. Hope we all ride together again. MiWinger51 and I are booked! Looking forward to meeting everyone!! Thinking seriously about this Ride/In. I haven't been to any of the Docs Ride/Ins yet. Haven't made hotel reservations and would like to share a room. Anyone having made a reservation looking for a roomie? I'd like to arrive Wed to attend the whole event. The 13th is my Birthday. This R/I is my gift to myself. 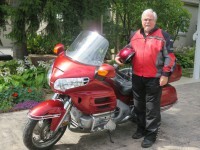 I will be riding from Niagara on the Lake leaving around 8 am on Sept. 12. Anyone going through here or along the route so we can ride together? If anyone is further east in Ontario we have a spare bedroom you can use on the 11th to break up the ride. Let me know. Larry, I would suggest that you make a reservation to ensure that you have a room. When (and if) you find a roomie, you can always cancel your reservation. Are the reservations able to be canceled with sufficient notice? Also, does the quoted price include the taxes? I understand the combined taxes are 11%. Presently I can get a Double Queen room for $404.60 for the 4-nights NONREFUNDABLE. Or $476 for the 4-nights REFUNDABLE BEFORE Sept 10TH. BOTH rates INCLUDE all taxes. Not sure how long these rates will be available for me. I'm waiting for an answer from our son-in-law and will be contacting Corkster52 who I understand needs a roomie to but I don't know if he already has a room or not. I'll jump one way or tuther any day now. Looking forward to meeting a bunch of new friends. Hey Brian, did you happen to get a group code when you set this up? Excuse my dumb question - are there day rides available for each of the four days ???? I do enjoy the riding !!!!! Hi, glad to have you aboard! There isn't another ride where you will meet the nicest people. I guarantee that you will make this annual event. Wednesday Sept 12 is the day which most will arrive. Others will arrive in following days depending upon their schedules (i.e. the ability to get off work). There will be rides on Thursday, Friday and Saturday. Sunday is the day to go, sadly, back home. Parkersburg was selected to its proximity to Hocking Hills where Saturday's ride will be. The other days will be used to explore the surrounding area. West Virginia has some really nice roads. BTW, there are no dumb questions... just dumb answers! When you make the reservation, mention that you are with the GOLDWING DOCS group and you'll get the discount rate. Unfortunately, taxes will be added upon checkout. There is nothing that as a group we can do about that - short of voting. If you are not on the list, please let us know. I have heard from several others that they may attend but still awaiting definite confirmation. Haven't booked yet, on the agenda for tomorrow. Not too many things will keep me from this! Looking forward to seeing everyone again, and hopefully some new faces as well. The Corkster and I will be sharing a room for the four-nights. We both plan to arrive on Wed the 12th. Looking forward to meeting everyone and enjoying SE OH and W-Va.
For you guys that have never been to W-Va, you won't be seeing it all on this Ride. If you flattened W-Va out,... it would be as Big as Texas! or as small as the closest buck that wants to jump the bramble bush and total our your ride. I am booked at the Hampton arriving Wed Sep 12 and checking out on Sun Sep 16. cu there. Just made reservations for my wife and I. 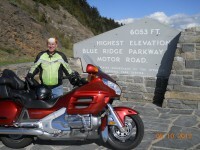 We are looking forward to making new friends and riding the roads of West Virginia. Thanks for putting this together. We are booked for Sept 12 and checking out Sept 16. Is there any updated info on camping for this event?